Nanotechnology continues to advance in a variety of industries, including aerospace, research, pharmaceutical, and academia, yet few effective containment solutions for particles that range in size from 1nm to 100nm exist. 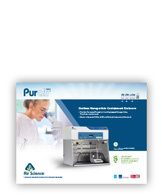 The Purair® NANO enclosure is designed to contain nanomaterial particles that are 100nm or less in diameter (ultra fines). 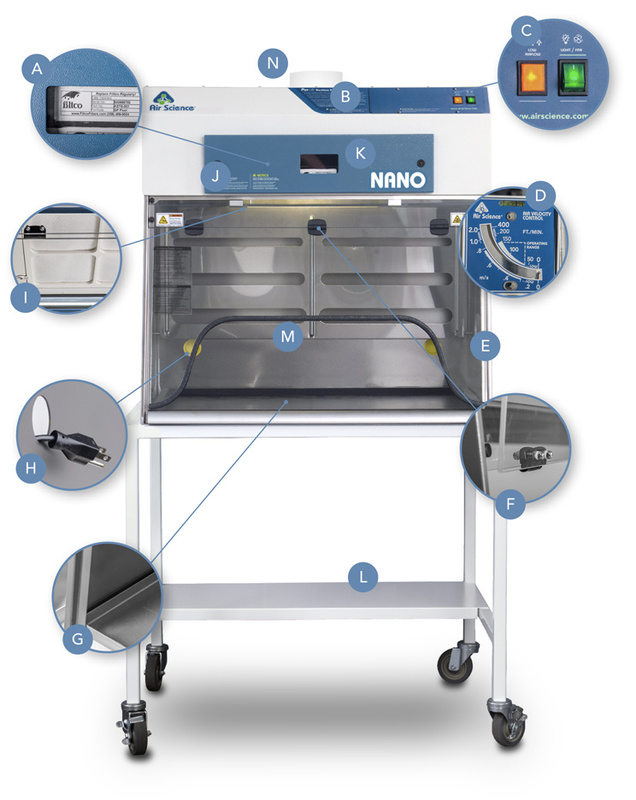 With a stainless steel infrastructure, powder-coated fan filtration unit, and dual filtration options to ensure superior containment, the Purair NANO provides personnel protection from engineered nanoparticles, fine dusts, and aerosols at an affordable price. The ductless nanoparticle containment enclosure meets or exceeds OSHA, ANSI and related International Standards. At the heart of the Purair product line is innovative ductless technology. Air Science ductless enclosures isolate and trap powders and particulates to prevent ecological impact through release into the environment. The easy to install ductless nanomaterial enclosure is self-contained and does not require venting to the outside. Because filtered air is returned to the room, no demands are required of the facility HVAC capacity for make-up air. Protects the operator from nanomaterial particles (less than 100nm in size) encountered during processing of carbon nanotubes, lithium batteries, and rare earth metals. SafeSwitch™ Filter Shutter System (optional) for safer bag-out filter exchange. Improved filter clamping eliminates bypass leakage. High efficiency ebm-papst EC blower. Purair P5-36-XT (NANO), shown with optional mobile cart. A. Filter I.D. Window: A strategically placed front cover window shows the installed ﬁlter part number and installation date to encourage timely ﬁlter replacement. B. Control Panel: Electronic controls and displays include switches for the blower and low airﬂow alarm. Ergonomics, safety and aesthetics all come together with the 10º pitch of the face. E. Stainless Steel Support Frame: The 304 grade stainless steel provides excellent strength, chemical resistance, and is cleanroom compatible. The satin finish enhances illumination. F. Hinged Front Sash: When closed, the cabinet sash protects the contents from inadvertent external contact and better isolates the air within. The sash is easy to open and close and includes a self-locking feature. J. Filter Door Key: Filter access keys prevent unauthorized removal or accidental exposure to dirty ﬁlters. K. Internal Manual Speed Controller: Authorized personnel may set the EC blower speed as desired. L. Stand: An optional mobile cart with locking casters is available. M. Rear Internal Baffle: Rear bafﬂe provides smooth horizontal airﬂow pattern. Removable for easy cleaning. N. External Exhaust Connection: Removable 6" diameter exhaust connection port allows ducting to the outside and comes standard on every Purair NANO. SafeSwitch™ Filter Shutter System: (Optional) A unique filter shutter system closes the exposed filter media face and minimizes exposure to the contaminated filters, protecting the operator and the environment. 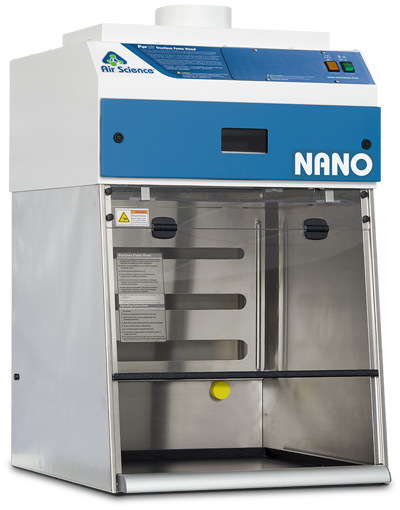 The Purair NANO Series ductless nanoparticle enclosure maintains a constant face velocity of 100 FPM in compliance with USA and international standards for safety and performance. 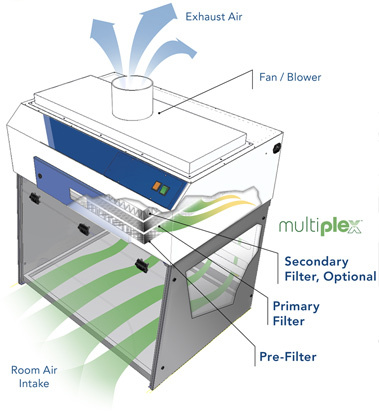 Contaminated air is pulled through the Multiplex™ filtration system and clean air is returned to the room. A. The main filter is easy to replace, no tools required. The filter clamps tightly against the filter gasket to prevent filter bypass and maintain filter integrity. The optional SafeSwitch HEPA Filter Shutter system also ensures that operators are safely separated from trapped contaminants during filter changes. B. Exhaust is thoroughly scrubbed of nanomaterials produced from actions within the hood. C. Choose from HEPA (ULPA optional) or activated carbon. 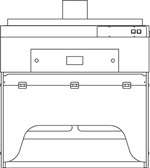 If HEPA/ULPA is chosen the cabinet can be used without connection to an outside exhaust. Both HEPA and ULPA filters use micro-glass fiber media designed to capture fine particles and biologicals. 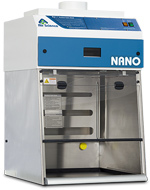 Learn more about the Purair NANO Ductless nanoparticle containment enclosure line by downloading the brochure or by visiting our Specifications tab that includes information for each model.